So ends the classic Christmas cartoon, “How the Grinch Stole Christmas.” He didn’t steal Christmas, of course. He never could have, and that’s the point. No one can stop Christmas from coming (not even the Grinch). 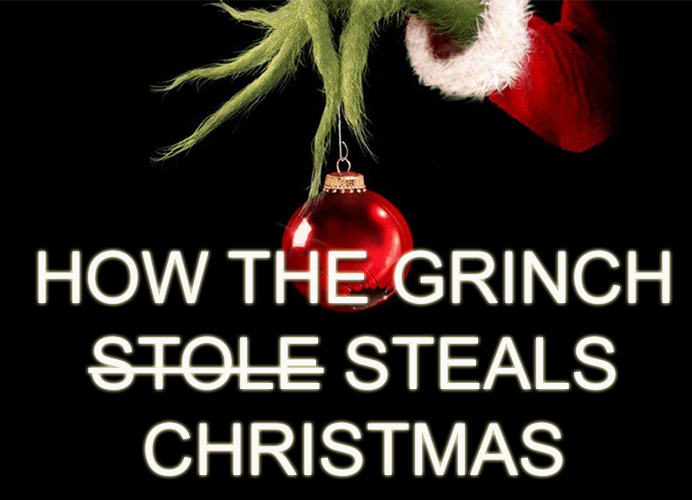 You can’t “steal Christmas.” But you can have the spirit of the holiday stolen from you. There are ways to ruin the celebration, both for yourself and for others. There are two Grinch-like spirits that threaten to “steal” Christmas still. The spirit of the original Grinch is well known, and for good reason. This sin has longed plagued humanity, and it goes by many names: idolatry, covetousness, materialism, consumerism, greed. It is the worship of stuff, the elevation of gift above the Giver. This was the original sin of humanity in the garden, and it is with us still. Every year the exchanging of gifts at Christmastime carries a potentially soul-destroying power. There is nothing wrong with having stuff, as the old saying goes, so long as your stuff doesn’t ‘have you.’ Could you rejoice with the Whos down in Whoville, if for some reason you awoke to no gifts, no decorations, and no feast of roast beast? Money and the stuff we can buy with it is not the ‘root of all evil,’ as is so often misquoted. But the love of money is the root of all kinds of evil (1 Tim. 6:10). It lures people away from the grace of God into a soul-crushing craving for more things, a hunger for that which can never satisfy. This Grinch will not go away until the possibility of loving the gift more than the Giver is destroyed forever at the return of Jesus. In the meantime, each Christmas is a struggle. Will we be thankful for what has been given, or we will give in our incessant craving for more? Will we consider the love and sacrifice of those who have given to us, or will we think only of the gift itself? Will we resist the Grinch of greed and materialism and envy and covetousness? The original Grinch is here to stay, as we’ve already said. But there’s another Grinch in town. Ironically, the first Grinch has given rise to the second. For years we heard him say, “It came without ribbons!… It came without tags!… It came without packages, boxes, or bags!” And we got the message—the wrong one, that is. For more than two generations now the moral of the story has been this: Christmas is not about stuff. It’s not about presents or decorations or anything physical. You see this spirit powerfully at work today, especially on the internet. You see it in blogs about materialism and rants on Facebook. You hear it in the sneers of those who mock Black Friday shoppers. There is a kernel of truth in their concerns, but beneath it all is the work of another Grinchy spirit. The “new” Grinch is actually an old problem, almost as old as idolatrous greed, and this spirit goes by many names: self-righteousness, religious asceticism, Gnosticism, dualism. The fact that you may not have heard of those doesn’t mean they aren’t dangerous. On the contrary, they are more so. When all you ever hear about is the ditch on one side of the road, there is a frightfully good chance it’s because you’re already in the ditch on the other side. Yes, Christmas means “a little bit more” than stuff (contrary to the original Grinch), but Christmas does not mean less than physical things (contrary to the new Grinch). After all, the ultimate gift from God was a physical gift: “The Word became flesh and dwelt among us. We have seen his glory, the glory of the one and only Son, who came from the Father, full of grace and truth” (John 1:14). In Jesus, the grace of God took on flesh and bone. 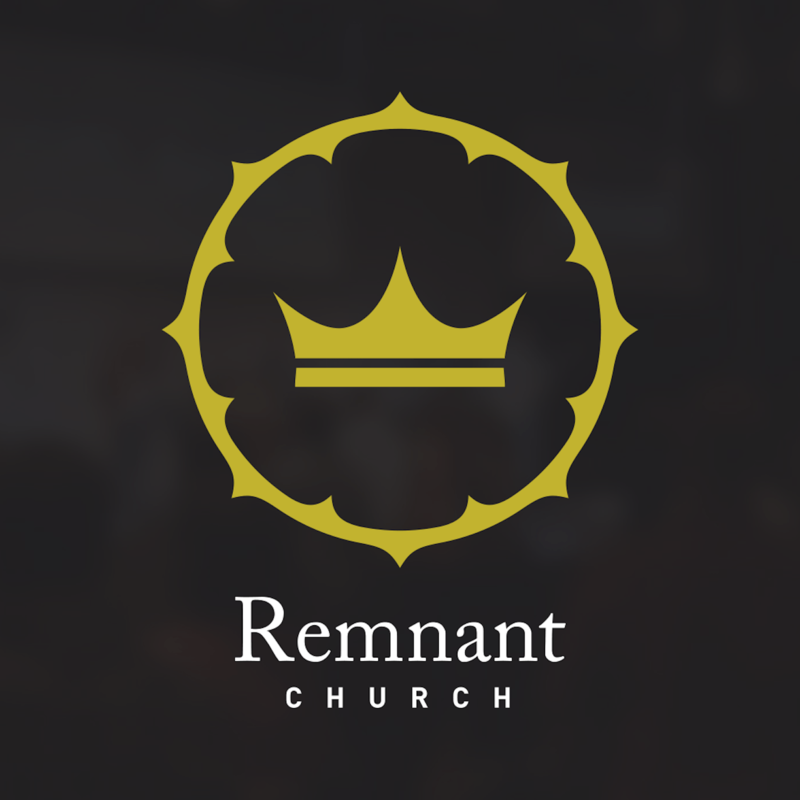 The image of God invisible became incarnate for all to see. Love was not merely a feeling in God’s heart; it was baby in a manger and a man on a cross. If anything, Christmas is the holiday most about physical things! Certainly, we know how to sin with stuff. We overindulge. We run up our credit cards. We buy things hoping they’ll bring lasting happiness, only to feel emptier than boxes the day after Christmas. The original Grinch is still a threat, and we need to resist him. But the way to do so is not by getting in bed with the new Grinch. In other words, we are just capable of sinning without stuff, too. We sin by shunning the stuff of God’s world and degrading the existence he gave us. We act as if the physical is bad or at least unnecessary, and the “true spirit of Christmas” is some ethereal, intangible thing. But the resurrected body of Jesus begs to differ. The whole world is being redeemed, the physical along with the spiritual. Jesus is Lord of both. So get out your ribbons. Get out your tags. Get out your packages, boxes, and bags. Make fudge and hang wreaths. Drink Christmas ales and lots of eggnog. Shop with gratitude and give gifts with joy. Decorate your home and put up a tree. Sing Christmas songs. And make more fudge. For the only way to fight both Grinches is to learn to give and receive gifts rightly. We are no better off if we escape the Grinch of materialism by joining forces with the Grinch of religious asceticism. Two wrongs still don’t make a right. And besides, salvation has always been about receiving, rejoicing, and imitating. We receive God’s gift with humble gratitude, we rejoice in the love that gave it, and we imitate that love with joy (Eph. 5:1). How do we imitate the love that gave the most precious gift ever given? We have to use the stuff of God’s world. We give gifts as physical as the body of Jesus. We don’t worship stuff, but we don’t spurn it either. We give and receive with hearts full of gratitude, and we celebrate by enjoying gifts to the honor of the One who gave them (1 Tim. 6:17). 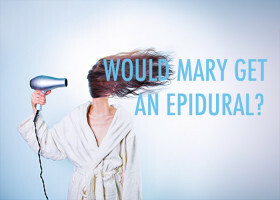 THANKSGIVING: THE HOLIDAY FOR EVERY DAY WOULD MARY GET AN EPIDURAL?